Hermannsburg is a small town that lies at the very heart of the Australian continent, about 130 kilometres to the west of Alice Springs on the banks of the Finke River and at the foot of Mount Hermannsburg. It is surrounded by red desert, stunted trees and spinifex, and is flanked by the MacDonnell, Krichauff and Gosse Ranges. The landscape features rugged mountains, deep gorges and arid plains and is subject to harsh drought and high temperatures. The area which includes Hermannsburg is called Ntaria by the Western Arrernte people. The indigenous community of Hermannsburg is centred around Mparntwe (Alice Springs) and is comprised of the Arrernte people. The language spoken by the Western Arrenrte people is Western Arrernte (Tyuretye Arrernte or Arrernte Alturlerenj) and Luritja. Hermannsburg, named after the German town where the missionaries trained, was established as a Lutheran Mission in 1877. At the same time, vast tracts of land were leased for cattle stations, displacing the Arrernte people who lived in the area. As a result, the people became reliant on the mission for basic survival necessities. In 1894 Pastor Carl Strehlow arrived and strove to improve the Mission, undertaking much research into Aboriginal culture and the Arrernte language, gaining the respect of his peers and the Aboriginal people. Following Strehlow, in 1926 Pastor F.W. Albrecht headed the Mission. He encouraged the men to carve and decorate objects such as boomerangs using hot fencing wire to burn in the design, thus forming the foundation upon which the acclaimed art movement at Hermannsburg was built. The Hermannsburg School movement, which took its origins in the 1930s, is an art movement, or style, characterised by watercolours painted in traditional European techniques, depicting the striking landscape and homeland of the Arrente people. Watercolour painting was introduced by Rex Battarbee, who first came to the area with fellow painter John Gardner in 1932. 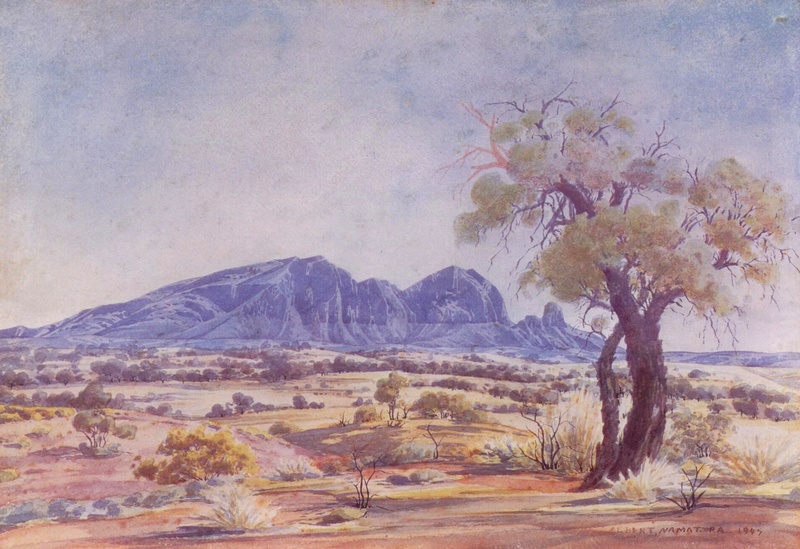 After two subsequent visits and a local exhibition of their paintings, Battarbee took special interest in Albert Namatjira and tutored him in the practice of watercolour painting. Battarbee moved to Central Australia in 1940 and during the 1940s and 1950s he was a member and chairman of the Aranda Arts Council. He continued to support Hermannsburg artists and promote their art, including from his own gallery, Tmara-mara at his home in Alice Springs. Based on Namatjira’s success, watercolour painting was quickly adopted by a number of indigenous people within the Hermannsburg community. The image of the Ghost Gum, which Albert Namatjira brought to popular acclaim in his paintings, features in the work of many of the Hermannsburg painters, and is a sacred and important part of Western Arrernte mythology. Previously, Western Arrernte people had only used art in a ceremonial sense, symbolically representing their country and their particular creation stories and mythologies. The Hermannsburg School represented a significant change in the direction of Australian Aboriginal art, making it accessible to collectors who were only familiar with western-style painting. During the 1970s Hermannsburg art fell out of favour with dealers and collectors who dubbed the style non-traditional. However, this has changed with a deeper understanding of the complexities of Aboriginal culture and consequently, the reputation of Hermannsburg watercolour artists has flourished. Beside those respected artists of the Albert Namatjira period, there are now many skilled practitioners of this distinctly Aboriginal style of landscape painting. The Arrernte following of Namatjira’s school of painting has continued at Hermannsburg and Namatjira’s artistic legacy has provided encouragement to other artists to incorporate new ideas and fresh inspiration into their art. This has lead to the continued strength of non-traditional media – such as ceramics and watercolour – in the arts centre. The most celebrated Hermannsburg painter and one of the most significant Australian Indigenous painters is Albert Namatjira. He was born with traditional name Elea at Ntaria on the Finke River Mission Station Hermansburg in 1902, at the time that his parents had moved in from ‘out bush’. Both he and his parents were baptised into the Lutheran faith and he was given the name Albert. However, Aboriginal traditions still retained a strong influence on his life and at the age of thirteen he was taken from the Hermannsburg settlement by the tribal elders to be initiated into manhood, and did not return for six months. Aged 18, Namatjira eloped with Ilkalita, a Luritja woman which displeased both his own community and that of the Lutherans. 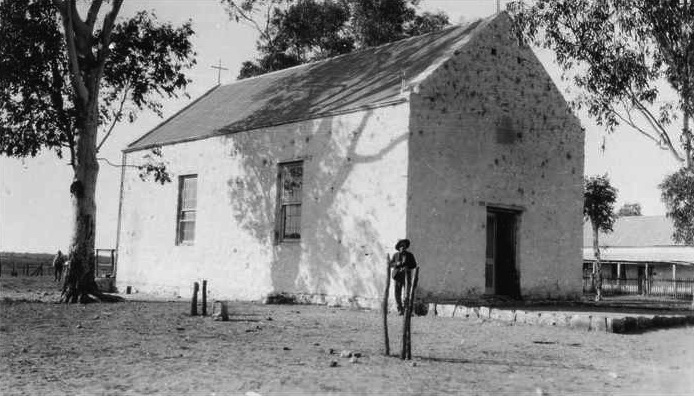 Namatjira had not followed Aboriginal custom, as Ilkalita’s skin group was inappropriate for their marriage, while the mission leaders were displeased she had not been baptised. 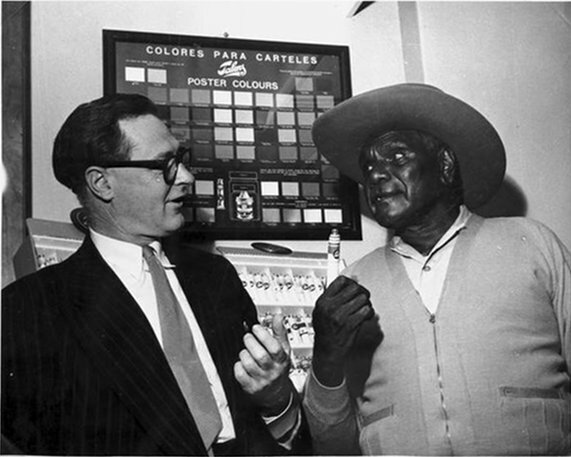 Image: Albert Namatjira with artist William Dargie, c.1950, National Library of Australia PIC/7569/52. The couple left the Mission and for several years Namatjira worked as a blacksmith, a stockman and as a camel driver with an Afghan caravan owner. They eventually returned to the Mission as a result of a severe drought that had made life in the outback near impossible. Upon their return, Ilkalita and their children were baptised and Ilkalita was then known as Rubina. In the early 1930s Namatjira worked in the Mission producing craft objects for the tourist trade and the impulse to his developing creative genius can be seen in the quality of the objects he fashioned at that time. 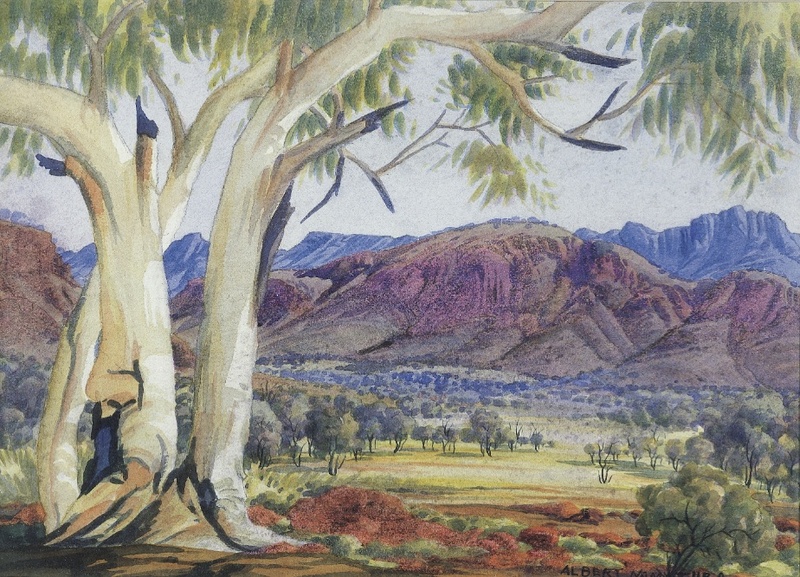 In 1934 Namatjira saw an exhibition in the Hermannsburg Mission schoolhouse of watercolour paintings by visiting Melbourne artist Rex Battarbee. When Battarbee returned to Hermannsburg in 1936 Namatjira was waiting for him with a conviction that he could paint. An arrangement was made whereby Namatjira worked as Battarbee’s camel-boy in exchange for painting lessons instead of a wage. They set off together on the first of two, month-long painting trips. It was during these two trips where Namatjira painted continuously, that he learned and acquired the skills that were to project him to fame as an Australian artist. He had an incredible natural talent, imbuing his paintings with a strong sense of the spirit of the country he loved so much. In 1938 his first solo exhibition of 41 paintings was held in Melbourne and sold out. Following Western artistic practice, Albert took the name of his father, Namatjira and then signed his paintings Albert Namatjira. The following decade brought Namatjira much popularity and commercial success, with exhibitions in many of the country’s capital cities. In 1953 he was awarded the Queen’s Coronation Medal. Australian law at the time dictated that Aboriginal people were not permitted to own property as they were not classified as Australian citizens. Therefore, Namatjira was unable to lease a cattle station or build a house to secure any future stability for his wife and children. Perhaps because of his celebrity status, this led to public outrage, and prompted the government to grant citizenship to Albert Namatjira and his wife in 1957, making them the first Indigenous people to be granted citizenship in the history of Australia. As Australian citizens they were freed from many of the restrictions placed on Indigenous people, and given the right to vote, own property and buy alcohol. Devoid of these rights, many of Namatjira’s tribe expected him to share these things with them, and he was prompted to buy alcohol for them. By tribal law Namatjira was obliged to share everything he owned with his clan. When an Indigenous woman was killed in an alcohol-related incident, Namatjira was held responsible for bringing the alcohol into the Aboriginal settlement, and was sent to serve six months in prison in 1958. The sentence was appealed and reduced to three months, but he was released after serving only two months due to poor health. After his release he was dispirited and lacked the motivation to paint. He died of heart disease complicated by pneumonia in 1959. Namatjira’s watercolours are an embodiment of the spiritual bond with his ancestral land depicted in a visual form recognised and easily understood by European outsiders. His paintings dispelled the myth that Indigenous people only portrayed their country in cultural ways. This was made clear in an exhibition curated by the National Gallery of Australia, Seeing the Centre: The Art of Albert Namatjira 1902 – 1959, which toured in 2002-03. Although pottery has not been a traditional art form of the western Arrernte people, they now have developed a strong sense of tradition surrounding the pottery that comes from Hermannsburg. First introduced by missionaries in the 1960s to the indigenous men of the area, pottery was encouraged and developed by Naomi Sharp (appointed by the Northern Territory Open College). Sharp visited the surrounding outstations in 1990 teaching simple techniques to create glazed clay pots. Hermannsburg pottery has quickly gained popularity throughout Australia and internationally. As pottery is fairly new to the area, it is used as a vehicle for artistic expression, rather than a functional craft form. Today, the potters working in Hermannsburg are women and Hermannsburg Potters Incorporated is owned and operated by Arrernte women. Using the coil and slab methods and the ‘pinch-pot’ technique, the artists sculpt their unique pots, capped by lids decorated with little clay animals and birds. They paint their stories on the round vessels in particularly unique and individual ways, using underglaze to further diversify the range of coloured decoration. The artists have further increased their practices to include the making of clay tiles used for murals. These relief tiles depict bush tucker and Dreamtime stories. Many of the Hermannsburg artists are descendants of the Hermannsburg school of watercolour artists and grew up influenced by the Westernised paintings of their relatives. This influence, combined with the vibrant colours of their land is reflected in the bright ceramic underglazes characteristic of their work. The work of Hermannsburg Potters has been collected by most state galleries as well as other significant institutional and private collections, including: Museum Victoria; Parliament House; Holmes a Court Collection; Laverty Collection and Taronga Zoo, Sydney. They are also the subject of a colour-illustrated hardback publication featuring thirteen artists, Hermannsburg Potters: Aranda Artists of Central Australia (1999).